The North Weston service station development will make a big difference for Weston Creek and Molonglo motorists. Photos: Ian Bushnell. 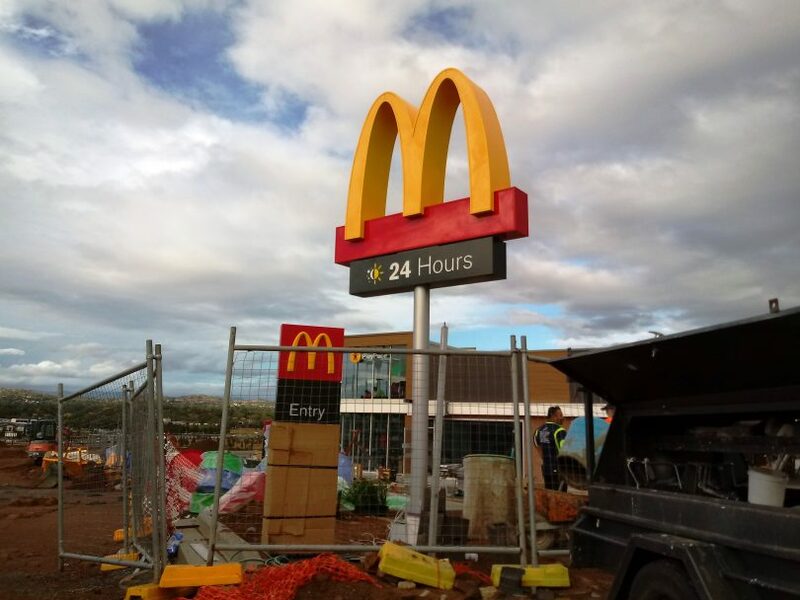 The long-awaited new service station in North Weston is fast taking shape, as an Assembly committee continues its inquiry into fuel pricing in the ACT. Like many new fuel outlets, it comes with two fast food stores as well as a shop, and the golden arches of McDonald’s have been raised along with the building in which it and Oporto will be housed. Fuel tanks and infrastructure have been installed with the hardstand, bowsers and canopy still to come. The Caltex service station on the corner of Cotter Road and Kirkpatrick Street will provide some welcome competition to Weston Creek’s sole remaining outlet, also a Caltex, in Brierly Street, opposite Cooleman Court. It will capture the streams of traffic along Cotter Road to and from Weston Creek and the growing suburbs of the Molonglo Valley. Whether it results in cheaper fuel remains to be seen but the fact that it is on a major Canberra road might help if one believes the view of the Australasian Convenience and Petroleum Marketers Association (ACAPMA) in its submission to the inquiry. ACAPMA, not surprisingly, does not believe regulation or legislation will bring down fuel prices in Canberra but suggests better support for the establishment of new service stations, particularly discounters and independents, would make a difference, particularly if they are on visible and easily accessible sites where high volumes can mean cheaper prices. It also points to higher lease and fuel distribution costs in the ACT than interstate. And it confirms what many have believed – that Canberra’s higher average earnings attract premium prices, although that is just the ‘homogenous’ nature of the market not ‘gouging’ as all sides of politics in the ACT claim. The fast food section of the development on Cotter Road. But ACAPMA says convenience often trumps price in this kind of market with most customers continuing to patronise their local service stations despite potential savings elsewhere. “This finding is consistent with observed behaviours in high wealth markets where customers adopt time-poor cash-rich purchase behaviours – and retail businesses (regardless of the industry they operate in) respond accordingly,’’ it says. For those not so well off, the price of fuel in the ACT has a big impact. ACT Council of Social Service (ACTCOSS) has also made a submission to the inquiry and its Executive Director, Susan Helyar, says transport is the third biggest cost for low-income households in Canberra after housing and food. But if the prices do not differ between North Weston and Cooleman Court at least another option for drivers may cut the queues at peak fill-up times. Canberra will hopefully be getting another discount outlet, even if it is in Fyshwick, with plans lodged late last year for another discount Metro service station on the site of Capital Car Wash in Whyalla Street. ACAPMA believes having more of these and independents such as United is the best way to create some ‘tension’ in the market, which would lead to cheaper fuel overall. It also says the recent announcement by Coles Express and Viva Energy about a change in the operating nature of their alliance is expected to put downward pressure on fuel prices – and the Canberra market is likely to be one of the most significant beneficiaries. Work out where your nearest bus stops are to your home and your place of work. I will be surprised if the distance required to walk to and from those bus stops amounts to 10K steps per day. Walk 10K steps per day is the minimum recommended amount of moderate exercise your doctor will recommend. If you care to look at my profile, I spent a large portion of my career working for Caltex. BTW, cycling to work is also an option. I did that for a large portion my working life. Johnny Barlow you gonna put unleaded in the diesel tank at this one too? Really depends on the contract. If it’s a franchise, then they get paid buy the litre of fuel sold regardless of the price. Let’s stop smashing the operators. Let’s focus on the multinationals. Apparently Tara Chayne (ACT Labor) is heading an inquiry into this disparity. I’m looking forward to the findings. This new one seems to be Caltex operated but they don’t own the site and building. Interestingly the existing one at weston I believe is privately owned, but Caltex branded. I don’t think many if any service stations these days are franchised. Shell started the move from franchise to owned in the late 80’s by moving from individual site franchise to multi site and then in the 90’s being company operated and eventually the rights being sold to Coles and the actual stations to Viva. Though maybe you are confusing franchised with private ownership but entered into a brand and supply agreement with a main brand like Caltex, BP or Mobil. (Don’t think Shell does private branding any more). Another Costco would be good. Won’t be cheap if it’s Caltex... even if it had a competitor nearby. I wonder if they will bother putting in an LPG pump or just let the Weston Creek area continue to survive with only one of them Gai Brodtmann You mentioned a few months ago that Weston only had one diesel pump. Fuel to me is not third after housing and food, it is second to housing. I thought when it was originally sold the talk was it was an independent servo that was going there. Caltex or Shell, same thing either way will pay too much. Caltex Weston Creek is on par with all the Coles/Shell outlets and you are paying 10c a litre more. It'll be interesting to see what it means for the bowser price! 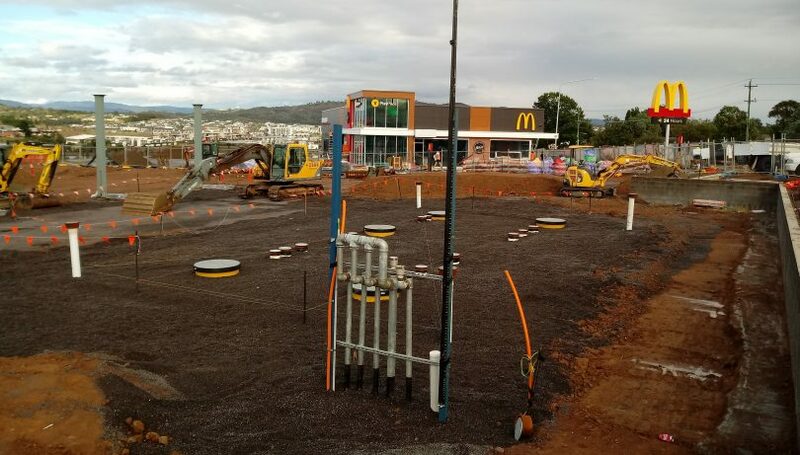 I swear 3 weeks ago that maccas wasn’t even a thing. Wowsa that went up quick! We’ll continue to fill at Costco every Friday evening, do our shopping at Costco, and sample the free food at the same time. Can’t lose! Real time price reporting. NSW has it, make it happen. Tiger Reeves anything wrong with fuelspy or the other half dozen free fuel watch type apps/websites? Cheaper petrol......🤣 - it’s Canberra, for crying out loud. Could we cut Canberra’s exorbitant fuel prices?